The X-15A rocketplane was designed and built for the U.S. Air Force and the National Advisory Committee for Aeronautics (NACA, the predecessor of NASA) by North American Aviation, Inc., to investigate the effects of hypersonic flight (Mach 5+). Design work started in 1955 and a mock-up had been completed after just 12 months. The three X-15s were built at North American’s Los Angeles Division, at the southeast corner of Los Angeles International Airport (LAX), on the shoreline of southern California. The first flight took place 8 June 1959 with former NACA test pilot Albert Scott Crossfield in the cockpit of the Number 1 ship, 56-6670. 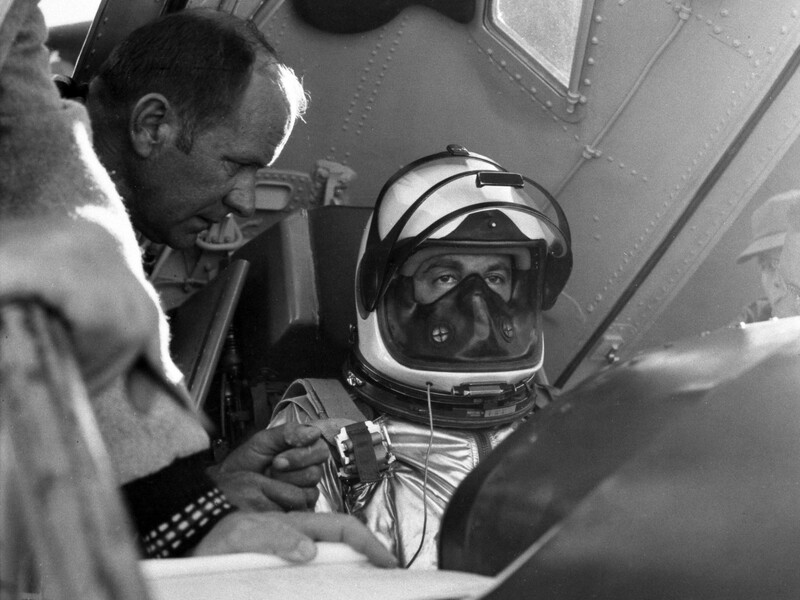 Scott Crossfield prepares for a flight in the North American Aviation X-15A. While earlier rocketplanes, the Bell X-1 series, the the Douglas D-558-II, and the Bell X-2, were airplanes powered by rocket engines, the X-15 was a quantum leap in technology. It was a spacecraft. Like the other rocketplanes, the X-15 was designed to be carried aloft by a “mothership,” rather than to takeoff and climb to the test altitude under its own power. The carrier aircraft was originally to be a Convair B-36 intercontinental bomber but this was soon changed to a Boeing B-52 Stratofortress. 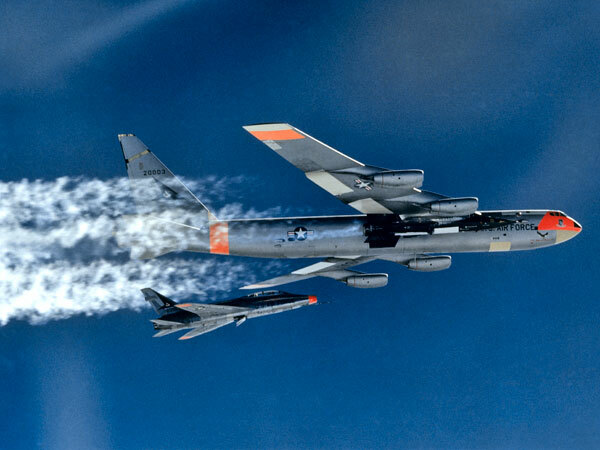 Two B-52s were modified to carry the X-15: NB-52A 52-003, The High and Mighty One, and NB-52B 52-008, Balls 8. From 8 June 1959 to 24 October 1968, the three X-15s were flown by twelve test pilots, three of whom would qualify as astronauts in the X-15. Two would go on to the Apollo Program, and one, Neil Alden Armstrong, would be the first human to set foot on the surface of the Moon, 20 July 1969. Joe Engle would fly the space shuttle. Four of the test pilots, Petersen, White, Rushworth, and Knight, flew in combat during the Vietnam War, with Bob White being awarded the Air Force Cross. Petersen, Rushworth and White reached flag rank. One pilot, John B. (“Jack”) McKay, was seriously injured during an emergency landing at Mud Lake, Nevada, 9 November 1962. Another, Michael James Adams, was killed when the Number 3 ship, 56-6672, went into a hypersonic spin and broke up on the program’s 191st flight, 15 November 1967. Flown by a single pilot/astronaut, the X-15 is a mid-wing monoplane with dorsal and ventral fin/rudders and stabilators. The wing had no dihdral, while the stabilators had a pronounced -15° anhedral. The short wings have an area of 200 square feet (18.58 square meters) and a maximum thickness of just 5%. The leading edges are swept to 25.64°. There are two small flaps but no ailerons. The entire vertical fin/rudder pivots for yaw control. Above 100,000 feet (30,840 meters) altitude, conventional aircraft flight control surfaces are ineffective. The X-15 is equipped with a system of reaction control jets for pitch, roll and yaw control. Hydrogen peroxide was passed through a catalyst to produce steam, which supplied the control thrusters. The forward landing gear consists of a retractable oleo strut with steerable dual wheels and there are two strut/skids at the rear of the fuselage. The gear is retracted after the X-15 is mounted on the NB-52 and is extended for landing by its own weight. 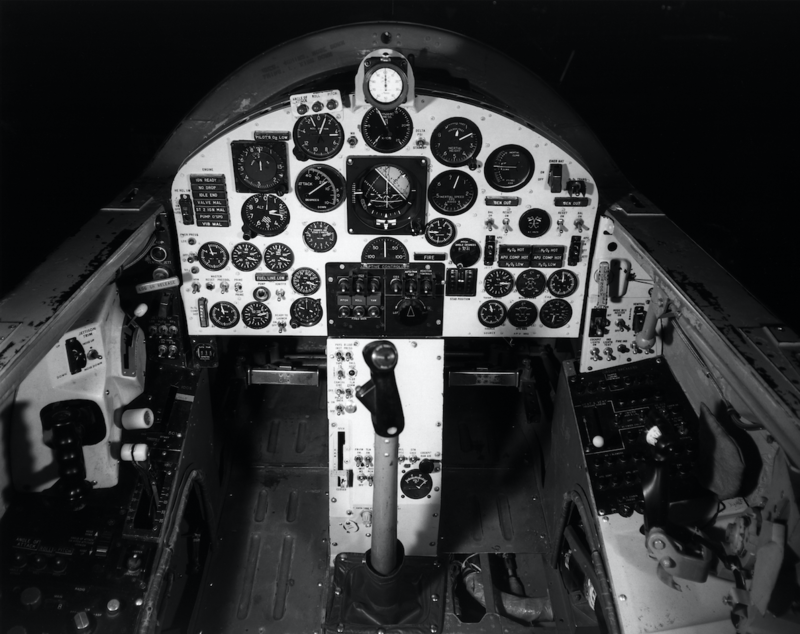 The rocketplane’s cockpit featured both a conventional control stick as well as side-controllers. It was pressurized with nitrogen gas to prevent fires. The pilot wore an MC-2 full-pressure suit manufactured by the David Clark Company of Worcester, Massachusetts, with an MA-3 helmet. The suit was pressurized below the neck seal with nitrogen, while the helmet was supplied with 100% oxygen. This pressure suit was later changed to the Air Force-standardized A/P22S. The X-15 is 50.75 feet (15.469 meters) long with a wing span of 22.36 feet (6.815 meters). The height—the distance between the tips of the dorsal and ventral fins—is 13.5 feet (4.115 meters). The stabilator span is 18.08 feet (5.511 meters). The fuselage is 4.67 feet (1.423 meters) deep and has a maximum width of 7.33 feet (2.234 meters). 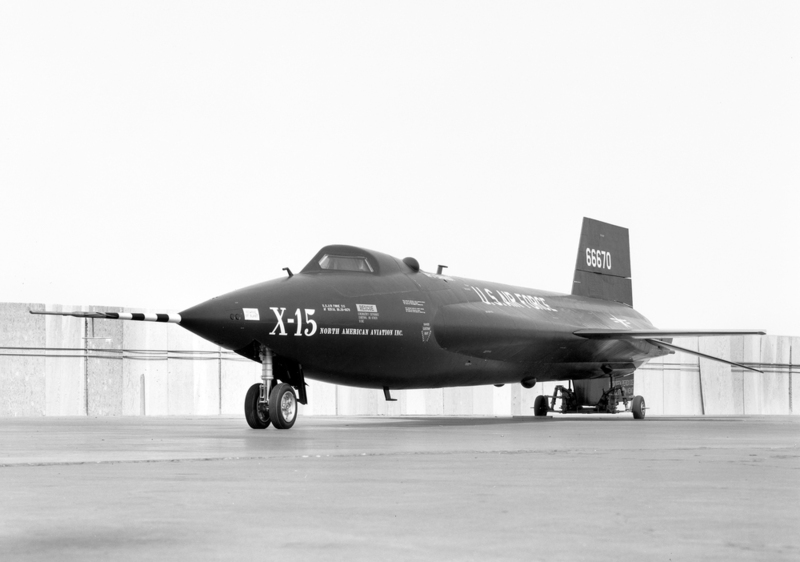 Since the X-15 was built of steel rather than light-weight aluminum, as are most aircraft, it is a heavy machine, weighing approximately 14,600 pounds (6,623 kilograms) empty and 34,000 pounds (15,422 kilograms) when loaded with a pilot and propellants. The X-15s carried as much as 1,300 pounds (590 kilograms) of research instrumentation, and the equipment varied from flight to flight. The minimum flight weight (for high-speed missions): 31,292 pounds (14,194 kilograms) The maximum weight was 52,117 pounds (23,640 kilograms) at drop (modified X-15A-2 with external propellant tanks). Initial flights were flown with a 5 foot, 11 inch (1.803 meters)-long air data boom at the nose, but this would later be replaced by the “ball nose” air sensor system. The data boom contained a standard pitot-static system along with angle-of-attack and sideslip vanes. The boom and ball nose were interchangeable. The X-15s were built primarily of a nickel/chromium/iron alloy named Inconel X, along with corrosion-resistant steel, titanium and aluminum. 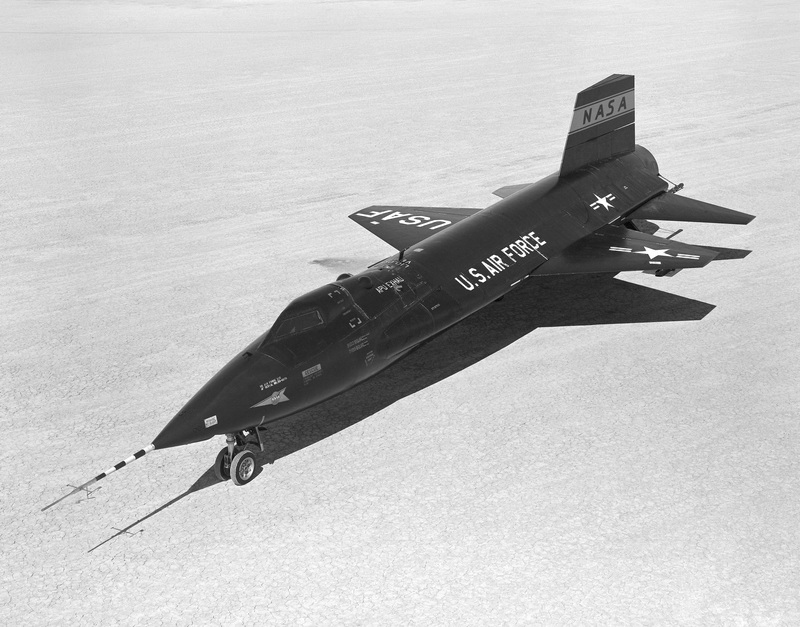 Inconel X is both very hard and also able to maintain its strength at the very high temperatures the X-15s were subjected to by aerodynamic heating. It was extremely difficult to machine and special fabrication techniques had to be developed. 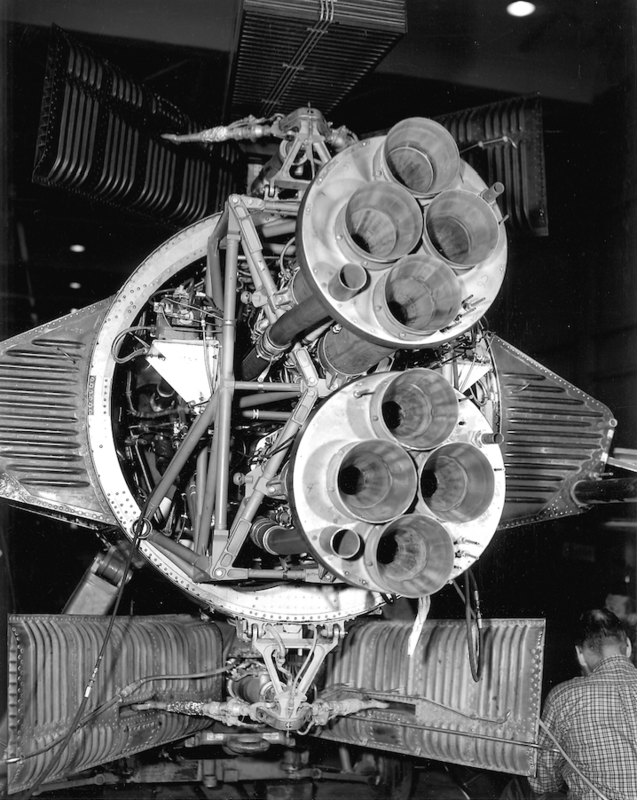 Delays in the production of the planned Reaction Motors XLR99 rocket engine forced engineers to adapt two vertically-stacked Reaction Motors XLR11-RM-13 four-chamber rocket engines to the X-15 for early flights. 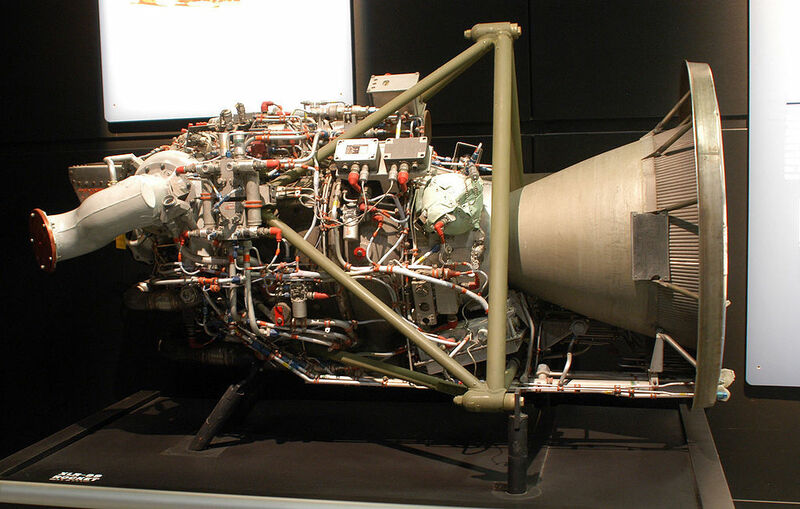 This was a well-known engine which was used on the previous rocketplanes. The XLR11 burned a mixture of ethyl alcohol and water with liquid oxygen. Each of the engines’ chambers could be ignited individually. Each engine was rated at 11,800 pounds of thrust (58.49 kilonewtons) at Sea Level. The Reaction Motors XLR99-RM-1 rocket engine was throttleable by the pilot from 28,500 to 60,000 pounds of thrust (126.77–266.89 kilonewtons). The engine was rated at 50,000 pounds of thrust (222.41 kilonewtons) at Sea Level; 57,000 pounds (253.55 kilonewtons) at 45,000 feet (13,716 meters), the typical drop altitude; and 57,850 pounds (257.33 kilonewtons) of thrust at 100,000 feet (30,480 meters). Individual engines varied slightly. A few produced as much as 61,000 pounds of thrust (271.34 kilonewtons). The XLR99 burned anhydrous ammonia and liquid oxygen. The flame temperature was approximately 5,000 °F. (2,760 °C.) The engine was cooled with circulating liquid oxygen. To protect the exhaust nozzle, it was flame-sprayed with ceramic coating of zirconium dioxide. The engine is 6 feet, 10 inches (2.083 meters) long and 3 feet, 3.3 inches (0.998 meters) in diameter. It weighs 910 pounds (413 kilograms). The Time Between Overhauls (TBO) is 1 hour of operation, or 100 starts. The XLR99 proved to be very reliable. 169 X-15 flights were made using the XLR99. 165 of these had successful engine operation. It started on the first attempt 159 times. 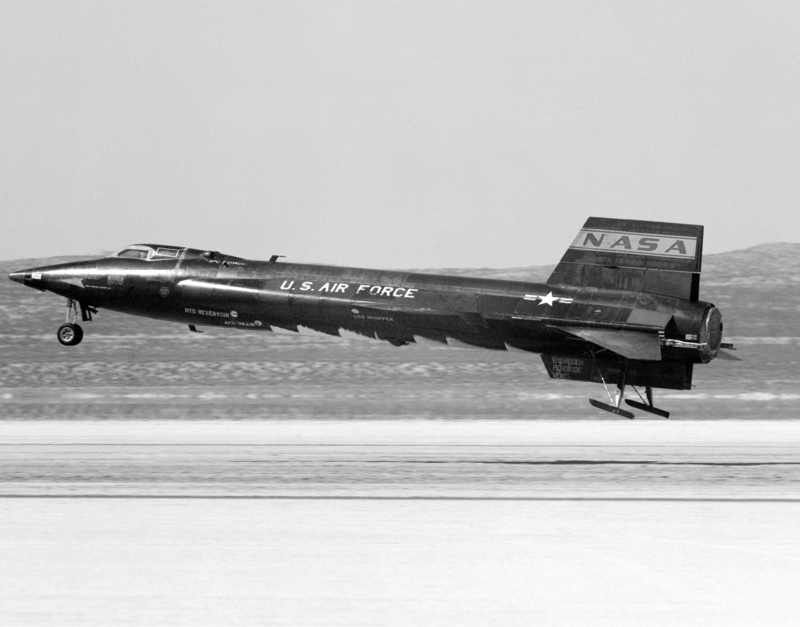 The highest speed achieved during the program was with the modified number two ship, X-15A-2 56-6671, flown by Pete Knight to Mach 6.70 (6,620 feet per second/4,520 miles per hour/7,264 kilometers per hour) at 102,700 feet (31,303 meters). On this flight, the rocketplane exceeded its maximum design speed of 6,600 feet per second (2,012 meters per second). The maximum altitude was reached by Joe Walker, 22 August 1963, when he flew 56-6672 to 354,200 feet (107,960 meters). The longest flight was flown by Neil Armstrong, 20 April 1962, with a duration of 12 minutes, 28.7 seconds. North American Aviation X-15A-1 56-6670 is on display at the Smithsonian Institution National Air and Space Museum. X-15A-2 56-6671 is at the National Museum of the United States Air Force. 23 June 1961: Major Robert Michael White, United States Air Force, became the first pilot to exceed Mach 5 in an aircraft. This was the 38th flight of the X-15 Program. 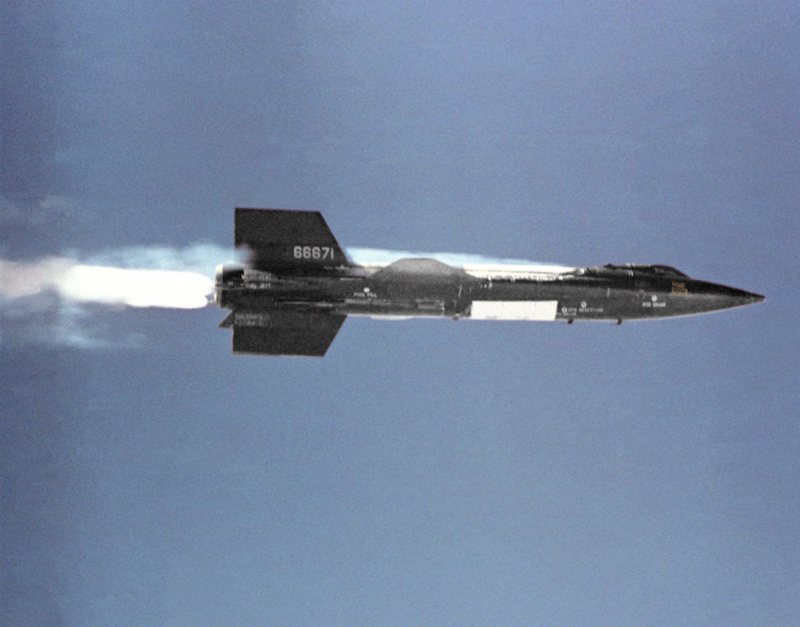 Flights during this phase incrementally increased the speed and altitude of the X-15 up to its design limits of Mach 6 and 250,000 feet (76,200 meters). The second North American Aviation X-15A, 56-6671, was air-dropped from the NB-52A Stratofortress mothership, 52-003, over Mud Lake, Nevada at 2:00:05.0 p.m., Pacific Daylight Time (21:00 UTC). White fired the Reaction Motors XLR99-RM-1 engine for 78.7 seconds, reaching Mach 5.27 (3,603 miles per hour, 5,799 kilometers per hour) and climbed to 107,700 feet (32,827 meters). 10 minutes, 5.7 seconds after being dropped from the B-52, White touched down on Rogers Dry Lake at Edwards Air Force Base. 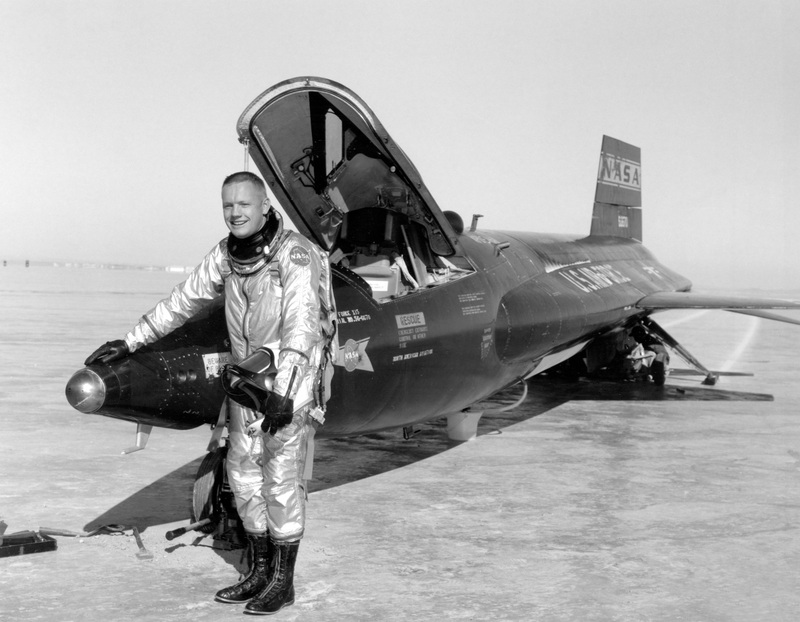 Bob White was the first pilot to exceed Mach 4, Mach 5 and Mach 6. 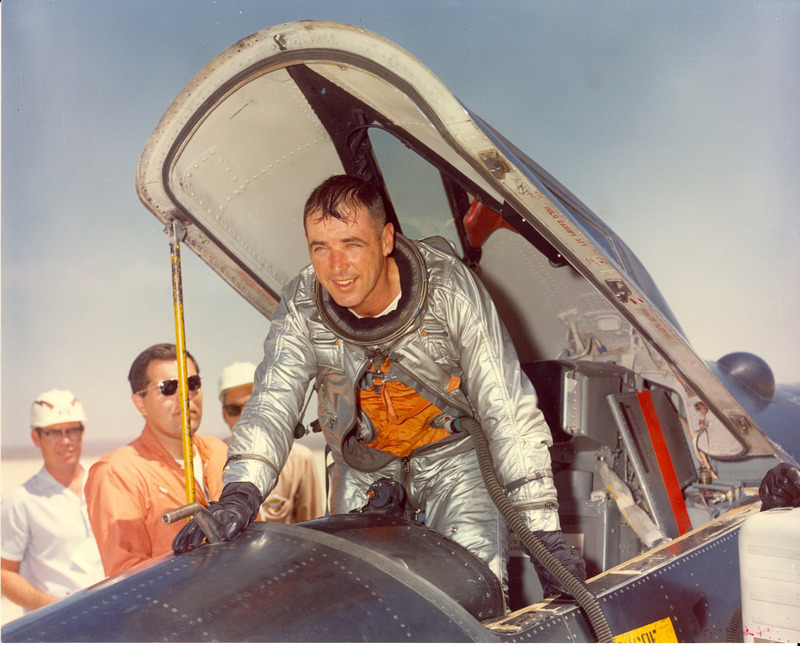 He also flew an X-15 to an altitude of 314,750 feet (95,936 meters), qualifying for U.S. Air Force astronaut wings. After leaving the X-15 program, Major White flew 70 combat missions in the Republic F-105D Thunderchief fighter bomber during the Vietnam War. He lead the attack against the heavily-defended Paul Doumer Bridge in Hanoi, 11 August 1967, for which he was awarded the Air Force Cross. Major General White retired from the U.S. Air Force in 1981. He died 10 March 2010. 56-6671 is in the collection of the National Museum of the United States Air Force. The mothership, 52-003, is on display at the Pima Air and Space Museum, Tucson, Arizona.